"The treatment is based on a daily therapy, the Early Start Denver Model, that is based on games and pretend play. It has been shown in randomized trials to significantly improve I.Q., language and social skills in toddlers..."
The therapy's focus on people-intensive interaction and play seems a good bet, and it won't do any harm if your child has been misdiagnosed or you are not sure if he or she has autism (families with an older child who has autism may be extra vigilant in taking precautions). "Even normally developing babies cannot speak or gesture, let alone pretend. Instead, Ms. Rogers has parents focus on babbling and simple social interactions that occur in the normal routine of feeding, dressing, bathing and changing the baby. “Patty-cake and peekaboo or tickle games, those are people games,” she explained to Carmen and Saul Aguilar during their first session with their son Emilio at 7 months old. Ms. Rogers talked about the next 12 weeks and how they would focus on getting Emilio to exchange smiles, to respond to his name, to babble with them, starting with single syllables (“ma”) and moving on to doubles (“gaga”) and more complex combinations (“maga”)." This is horrible! A number of children have been injured and several died before the product was recalled! Simple musical instruments for infants and toddlers are the perfect way to begin early appreciation of music. We found a beautiful example of a wooden xylophone (shown above) by Jim Doble at Elemental Design. Look for musical instruments made from natural materials to provide the best sound and tactile experience possible for your child. Jim has an inspiring collection of musical instruments made from wood, stone, tools, and more on his Children's Museum page. I found a fun video to share! The infant is absolutely focused on his or her movement and the parent is letting it all happen naturally. Really cute. We found a great cherry wooden rattle on the Australian site Eco Toys here. As a cheerful example of what TO buy, we love it! Bitable, simple, wooden, unpainted, no tiny parts, and no plastic. A fabulous sensory experience for your infant as he or she transitions from mobiles to developing key motor skills. Sorry for all the bleak posts lately! We kept coming across newly recalled infant items and wanted to make sure we shared them...but the posts are still bleak. 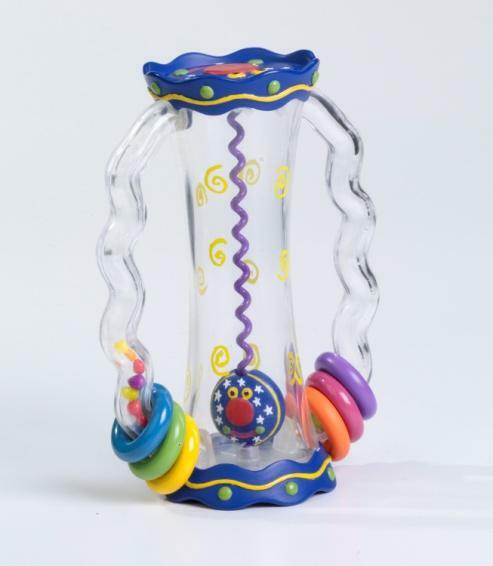 This recalled plastic rattle by Manhattan Toys is a perfect example of what not to buy, even if it had not been proven dangerous. More (cheerful) what TO do's in our Montessori teaching albums for infants. This huge list of recalled items mostly includes toys that have already injured or killed children. It is frightening to see how large it is and to realize that there are many more toys and items of children's jewelry out there with hazards that have not been discovered yet! Switch to using traditional Montessori style equipment at home and avoid needing to follow these recalls! A lot of material for the early years, you can make at home by yourself. This list contains non-toy items for infants and children! Check our earlier blog posts for ideas or check out our Montessori House teaching guides for Infants and Toddlers. 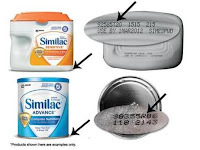 Earlier in the week, Similac recalled infant formula due to bug contamination. Here is Similac's page to see if your formula is on the list of contaminated formula. For parents overseas, note that this formula was also sold overseas including the Caribbean, Puerto Rico, and Guam. * STOP using sleep positioners. Using a positioner to hold an infant on his or her back or side for sleep is dangerous and unnecessary. * NEVER put pillows, infant sleep positioners, comforters, or quilts under a baby or in a crib. * ALWAYS place an infant on his or her back at night and during nap time. To reduce the risk of SIDS, the American Academy of Pediatrics recommends placing infants to sleep on their backs and not their sides. 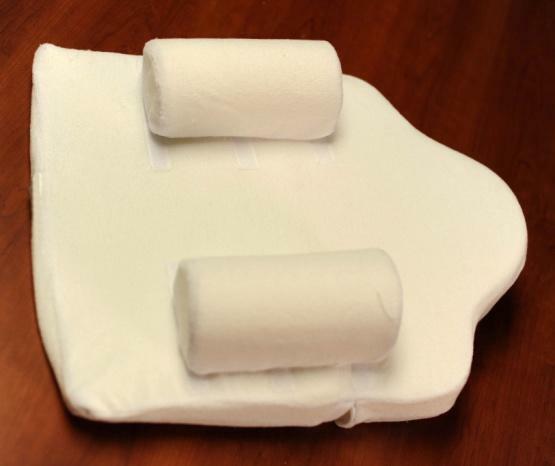 The American Academy of Pediatrics does NOT support the use of any sleep positioner to prevent SIDS. Note that it took a lot of deaths over many years to prompt this warning. We suggest that you not adopt new and trendy products for your infant. There are a number of tried and true materials such as the Montessori bed on the floor -- well, it's hard to mess that up -- and using a mat or towel to give your infant lots of "stomach time". Of course, these methods don't leave much for manufacturers to sell, so you will see lots of pressure and advertising for new things. Do not give in! Your infant does not need this stuff and, in the worst case scenario, it can kill him or her. That's a pretty big downside! If you are using the Montessori method for raising your infant, you will already have not purchased anything like this. Wow, 10 million defective tricycles, children's toys, infant toys, and high chairs have been recalled after a number of children got injured. "In the recall of about seven million Fisher-Price Trikes and Tough Trikes toddler tricycles, the agency is aware of 10 reports of children being hurt. Six of them required medical attention. The tricycles — some of which feature popular characters like Dora the Explorer and Barbie — have a protruding plastic ignition key near the seat that children can strike, sit on or fall on, leading to injuries that the commission said can include genital bleeding. Fisher-Price is also recalling more than a million Healthy Care, Easy Clean and Close to Me High Chairs, after 14 reports of problems. Seven children required stitches, the commission said. The pegs on the back of the high chairs can be used to store the tray, but children can fall on them, causing cuts and other injuries." Over "... 2.8 million Baby Playzone Crawl and Cruise Playground toys, Baby Playzone Crawl and Slide Arcade toys, Baby Gymtastics Play Wall toys, Ocean Wonders Kick & Crawl Aquarium toys, 1-2-3 Tetherball toys and Bat and Score Goal toys. The valve of the inflatable ball on the toys can come off and pose a choking hazard to children, product safety agency said. The agency said there were more than 50 reports of the valves coming off. About 100,000 Fisher-Price Little People Wheelies Stand ‘n Play Rampway toys. The wheels on the purple and green cars can come off, posing a choking hazard." Infants and Toddlers: No Television and Computer Use! There is no disputing the fact that children under the age of two should not be sitting in front of a screen. "Pediatricians should urge parents to avoid television viewing for children under the age of 2 years. Although certain television programs may be promoted to this age group, research on early brain development shows that babies and toddlers have a critical need for direct interactions with parents and other significant caregivers (eg, child care providers) for healthy brain growth and the development of appropriate social, emotional, and cognitive skills. Therefore, exposing such young children to television programs should be discouraged." Everyone has heard how educational DVDs are supposed to enhance a child's vocabulary and language facilities. But that is only if you do not interact with your child properly. If a child has no other stimulus, perhaps a DVD is the only way that he or she will hear any vocabulary and have any type of stimulation, but this certainly does not apply to our readers and parents. Learn more about infant and toddler health and education using the Montessori method. We are posting this to try to get everyone together to nominate a dear friend and former teacher, Chandra Fernando, for the AMS Annual Living Legacy Award in recognition for her more than 50 years of service to Montessori, AMS and most importantly, children all over the world. The deadline is October 1, 2010! Please pass this along to any former students from teacher training, former Montessori students, friends or colleagues who might have missed our emails. If you have enjoyed our Montessori material, please join us in nominating this amazing teacher! I liked this use of the scarf with fringes because it is simple to set up and requires purchasing nothing! Your infant can lie on his or her bed, Moses basket, or a rug on the floor. Make sure that the fringes of the scarf will not shed and cause a choking hazard. This is a fabulous mobile because your infant can pull on the ring to make it move and make sounds. If someone has these for sale, let us know! Send a comment that includes your website and we'll post it. More about Montessori and Infants in our curriculum albums here. This mobile is a beautiful example of the grasping and batting practice that infants need. If you take the Montessori course for this age group, it is required homework. Not too hard to make, but this one came out really well! The idea behind the mobile is that you hang it within reach of your child, so that he or she can watch it, track it visually, and gain hand-eye coordination by batting at it in an attempt to grasp the tantalizing balls. This video is from Goosedesigns on Etsy. I just went to her store to try to order a mobile at the last minute, and she's busy, so I will have to shop in advance next time. Got the ring and strap from her for a gift and it was a lovely set. Child’s Ordeal Shows Risks of Psychosis Drugs for Young by Duff Wilson of the New York Times discusses the trend towards medicating young children has been disturbing to many of us in the Montessori community. "But many doctors say prescribing them for younger and younger children may pose grave risks to development of both their fast-growing brains and their bodies. Doctors can legally prescribe them for off-label use, including in preschoolers, even though research has not shown them to be safe or effective for children. Boys are far more likely to be medicated than girls. Dr. Ben Vitiello, chief of child and adolescent treatment and preventive research at the National Institute of Mental Health, says conditions in young children are extremely difficult to diagnose properly because of their emotional variability. “This is a recent phenomenon, in large part driven by the misperception that these agents are safe and well tolerated,” he said." Found a great short video on Youtube that I wanted to share! The table and chair are great, but the rest of the items could be replaced to make it a better experience. Observe the child. The cup is too big to hold well and it makes her movements clumsy as she is not able to practice real coordination skills. Traditional Montessori parents use a small glass that is heavy at the bottom (some shot glasses are made like this). The spoon is also giving her a hard time because it is too big, especially the handle. A smaller spoon would be much better. She could also eat slices of bananas from a smaller bowl. The bowl is also too big. But, hey, it's a good concept! As the child struggles, it would be better to show her how to eat by herself, holding a smaller spoon. A smaller, deeper bowl would allow her to easily get the banana slices (they could be sliced thicker and cut in half to make pieces that are easier to grab -- she could also use her hands). Looking for Montessori presentations for infants and toddlers? Check out our Montessori curriculum page! After reading a post on the excellent Chasing Cheerios blog where someone had commented that her Montessori Imbucare boxes "...smell really bad," I thought it good to do some DIY discussions. If any of the equipment you purchase for your child has an odd smell, get rid of it. The smell is caused by chemicals in the glue, paint, composites in the wood product, or the way the wood itself was processed. It is a common manufacturing ill from China and other countries. This Toddler Imbucare box is really easy to make because the main focus for your child is the matching of the colors and hanging the loop around the small hook. Making the stand out of wood is the best, of course, as it is attractive and provides stability. Just make sure the knit balls hang easily and securely without slipping. Child-safe paint for the circles beneath the balls should be the same shade as the knit balls themselves. Use a small rectangular box that maintains the proportions of the box to balls as shown in the photo above. Get a non-tapered wooden chopstick (or anything similar) and cut it to make pegs. The pieces should be about 3 inches long. Put 3 holes in the box, spaced evenly. Secure the pieces into the holes, leaving about 2 inches inside the box. You can use duct tape on the inside of the box to secure the pegs so they do not wiggle at all. Paint the circles. You are ready to go! Basically, when you make a piece of equipment for your child, focus on the points of interest. What draws your child to the equipment and what will maintain his or her focus? Why does your child return to use the same piece of equipment over and over again? Once you identify these points of interest, you will get the knack of making equipment that appeals to your child's stage of development. Put jam into a 1/4 cup measuring cup. Only put enough for a slice of toast. Provide your child with a small spreading utensil and a slice of toast cut in half. Do not make the toast too crunch when you toast it or it will crumble. Provide a small plate that your child can work on. For any snack or meal, try to see the event from your child's perspective. 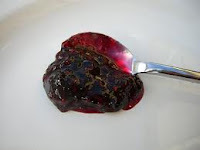 The portions need to be pre-prepared before you give them to your child -- for example, the concept of taking a scoop of jam out of the jar without using all the jam in the jar is too advanced for this age. Make sure your child has a small table and chair for all eating activities. Read beautiful stories and poems to your little ones to help them acquire the structure, vocabulary, and flow of the language. Look for illustrated children's poetry books so that your child can look at the pictures with the words as you read the poem. Working with wet chalk produces lovely results. Look for chalk that is slim enough for your child to hold it properly or use a lump of chalk that your child can grasp with his or her whole hand. 1. Invite your child to join you for this exercise (pick a quiet time of the day, so that your child does not have to settle down from active play suddenly). 2. Have ready a piece of construction paper or heavy white paper along with a tray that has chalk and a small dish of water. 3. Show your child how to dip the end of the chalk into the water and draw with the wet end. Your child will see the difference between using the wet and dry ends of the chalk. Remember to sit back and let your child experiment without critiquing or suggesting drawings (or suggesting what his or her drawings look like). The focus should be on the physical movements and motions and your child's development. Montessori from the Start: The Child at Home, from Birth to Age Three is a Montessori classic for parents and teachers of children between birth and three years of age. 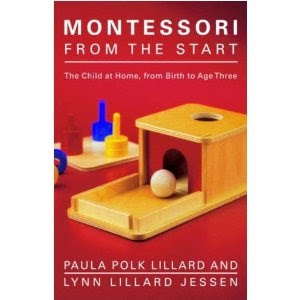 The authors, Paula Polk Lillard, and her daughter, Lynn Lillard Jessen, have crafted this amazing guide that provides down-to-earth, practical advice on how to introduce Montessori methodology in your home as soon as your infant is born. Beginning with easy-to-understand examples of how and why one needs a low infant bed, a mat on the floor, instead of a crib, and continuing through your infant's daily routine, the authors make sense of complicated concepts that include early childhood brain development and intra-family dynamics. We highly recommend this book for anyone who has an infant or toddler in the family. Great article in Yahoo news What NOT to Feed Your Baby has useful practical tips. For example, many parents would have figured that peanut butter was a no-no, but some may not have thought about skim milk (babies and toddlers require more dietary fat than adults) or honey. You can puree vegetables and, actually, most foods on your own, so if you are focusing on organic veggies and grass-fed beef for yourself, toss some in the food processor for your little one, too. 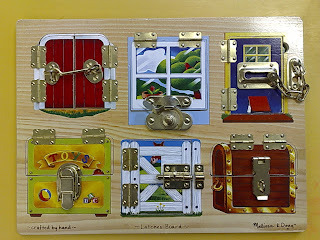 This is a fabulous puzzle by Melissa & Doug that provides lots of great fine motor skill and refined hand movement practice as your child locks and unlocks all the different types of fastenings here. You can also use this concept to make your own material. If you have a closet door that you are not using frequently, you can add additional locks and latches to the portion close enough to the ground that your child can sit and play. Official Montessori curriculum for infants and toddlers on our Montessori House site. For young children, the sense of touch is key to understanding the world around them. Encourage touch and exploration, discussing what your child is touching. Is it "rough" or "smooth"? Is it "bumpy" or "silky"? Use rich descriptive words that will teach your child the language to describe what he or she feels. In the Montessori class, materials such as the Rough and Smooth (Touch) Boards, Touch Tablets, and Fabric Box are some of the first touch materials that your child will use. Look for fabric, wood, different grades of sandpaper, different types of paper, and other materials that help your child learn about the language and explore the experience of touch. We were browsing online to look for good prices on Montessori math material and found a number of products that were called Montessori, but were not really Montessori products. For example, there are a number of counting blocks that have different colors. Do not use these. It is important that your child learn to count with identical objects such as the spindles in the Spindle Box, and it is also important that your counting set up include a space for zero quantity with the "0" above it. DIY Spindle Boxes can be made of cardboard boxes with labels drawn on with markers and filled with wooden chopsticks. Smooth the chopsticks with fine grain sandpaper and you are ready to go. This is an excellent exercise for a hot summer day! 2. Using the tongs, pick up an ice cube and transfer it into the punch bowl. 3. Ask your child if he or she would like to try. Hand the tongs to your child. 4. Let your child transfer all of the ice cubes to the punch bowl. He or she can observe the ice floating and melting in the liquid. At the end of this exercise, you can also show your toddler how to use a ladle to pour the water or juice into cups. Alternatives to this set up include using hands instead of tongs, putting the ice into a basin of warm water to watch it melt, or using tongs with something easier to pick up. More Montessori curriculum on our site here. This is an ideal summer project for older infants and toddlers. 1. Set up the washbasin outside (or inside on a surface that can get wet) and fill it 2/3 full of water. 2. Invite your child to join you. 3. Put a few drops of soap into the washbasin. 4. Swish the water around with the whisk. 5. Ask your child if he or she would like to try. 6. Let your child whisk away! After your child is finished with the exercise, the two of you can share cleanup. The reason to share cleanup is to create a joyful environment in which your child takes pride in his or her ability to keep the work area neat and tidy. You can create a special spot on a low shelf near a sink for the washbasin, soap, and whisk, so that your child can set it up at anytime. If the material will be used indoors, add a plastic cloth for the floor and a sponge for spills. Visit our site for a formal Montessori curriculum for infants and toddlers to use at home. We found this wonderful book at a great price on Etsy and wanted to share it with everyone. 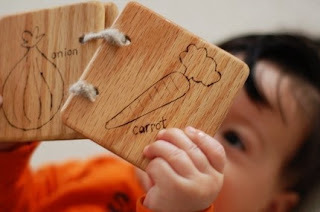 Wooden books and materials are ideal for infants and toddlers who delight in handling, dropping, and biting material. 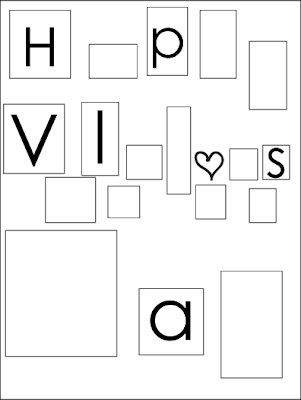 A seated infant or one lying on his or her stomach can play with the book as you read the words. He or she can touch the engraved vegetable pictures and letters as you say the words. This beautiful wooden book is handmade by Just Hatched at Etsy. Try to keep your infant in a ergonomically sound position at all times. Seated comfortably with his or her head supported in an infant carrier or car seat or lying on his or her back or stomach on a soft solid surface (rug or blanket). When your infant is lying on his or her back, you can interact in a variety of ways as you talk to your infant. For example, notice how your infant kicks his or her legs. As you talk to your infant. place your hands gentle in front of your infant's feet and play pat-a-cake with them. Your verbal interaction should include dialog in a regular voice (not high pitched or squeaky) with complete sentences or phrases. For example, you can sing the pat-a-cake rhyme or engage your infant with "right, left, right, left..." dialog as feet touch hands. Next, lie next to your infant and kick your feet up to touch your hands, if you can (or go as close as possible). Use your right hand to touch your right foot, and so forth. Tell your infant what you are doing as you do it -- "I am touching my right foot, and now my left foot..." Or count as you make each movement. If you follow the links, there are some fabulous photos of infant environments and setups with great material. We have focused on this issue before, but it is so important that we keep posting new information. If you are interested in Montessori, it doesn't help to have the most up-to-date and beautiful equipment if you are absorbed by your phone or Blackberry while you spend time with your child. This is definitely one of those situations in which the parents has to realize that he or she was at fault! If you absolutely must share work-time and child-time, think of guidelines that you can put into place and follow them stringently. Especially for those of you with children under three, your child must not feel as if he or she is competing with an electronic device for your attention. A lot of Montessori Primary classrooms, which traditionally have children in the 2 1/2 or 3 years of age up to age 6, are admitting toddlers as young as 20 months of age. 1. Create a separate toddler area because toddlers cannot handle having shelves full of tantalizing objects that they cannot yet use. A physical space, even if it is only demarcated by sets of low shelves, provides a contained area in which toddlers can have control of their own material and space. Try to use the corner of a room so that you have the benefit of two walls, one of which should have a window. Whether you are in a classroom or in your own home, create a toddler-safe area in which your toddler can touch and use all of the objects in the area. An entire room is best. 2. Put only a few items on the shelves per child at one time. 3. Use smaller floor mats that are easier to roll and unroll. If your Primary class mats are on the large and floppy side, stiffer smaller mats are a great benefit because toddlers can use them more effectively. 4. If you are trying to use Primary class equipment in the toddler area, pare down the sets before introducing them. For example, take only five Sandpaper letters for the introductory set or use only the first box of Spindle Boxes. 5. Supplement the area with DIY material for color matching, size grading, and sorting. Use material that is larger and easier to handle than traditional Primary class material. For example, create three boxes for red, blue, and yellow. Put five objects with those colors into the boxes, let children mix, match, and sort. 6. Start the day with a quiet active group activity like walking on the line, singing a song that involves clapping, or reading an interactive story. This helps children to focus themselves and adjust to indoor behavior naturally. For those of you at home, your toddler's bedroom and the bathroom should be completely safe and set up for independent use with toddler-sized material and equipment. Learn more in our Montessori album for Infants and Toddlers. Another timely article by Tara Parker-Pope, For Very Young, Peril Lurks in Lithium Cell Batteries discusses the dangers of "button batteries" that can easily be swallowed by young children. A child's own belongings may be battery-safe, but if your toddler can pick up your remote or iPod docking (see below), he or she is in danger. "...Two days after the battery was removed, Aidan began coughing blood, and soon died from his injuries. Such deaths are extremely rare. There were fewer than 10 documented during the last six years. But ingestion of lithium cell batteries, which children may mistake for candy and elderly adults for medication, is a surprisingly common problem, documented this week in two reports in the medical journal Pediatrics. About 3,500 cases of button cell battery ingestion are reported annually to poison control centers. But while swallowing batteries has occurred for years, the development of larger, stronger lithium cell batteries has increased the risk of severe complications. Data from the National Capital Poison Center in Washington found a sevenfold increase in severe complications from button cell ingestions in recent years. Moderate to severe cases have risen from less than a half percent (about a dozen cases per year) to about 3 percent (nearly 100 cases per year), based on a review of 56,000 cases since 1985. ...13-month-old Kaiden Vasquez of Bristow, Va., picked up the remote control to his parent’s iPod docking station. Somehow, he dislodged the battery and swallowed it. But his parents did not notice the missing battery when he began crying hysterically and could not be calmed. Emergency room doctors diagnosed a stomach flu, but a week later the child’s pediatrician took an X-ray and saw what he thought was a quarter. When the round item was removed, doctors discovered the battery and kept Kaiden for observation. The battery had burned a hole in his esophagus and trachea and he required a feeding tube and two months of home nursing care. Kaiden, who will be 3 in July, has recovered, although severe reflux after the incident damaged his teeth. “I don’t allow any of those disc batteries into my home,” said Kaiden’s mother, Amy Vasquez, who has three other young children. “I never thought a remote would do so much damage to my child. " Just getting ready to post a short lesson, ran across this article, and wanted to share it. The excerpts below are from an excellent article by Ronnie Citron-Fink With All the Toxins Found in Breast Milk, Is Breastfeeding Still the Healthiest Option? 1. Quit smoking or never start, and keep others from smoking in your house or car? 3. Avoid use of pesticides in the home and garden or on pets? 4. Avoid exposure to solvents, such as paints, non-water-based glues, furniture strippers, gasoline fumes, perfume and nail polish? 5. Avoid dry cleaners and recently dry-cleaned clothes? 6. Eat a balanced diet low in animal fats and high-fat dairy products? 7. Avoid fish that may have high mercury or PCB levels, such as swordfish, shark, tuna and locally caught fish (NRDC's guide to Mercury Contamination in Fish)? 8. Eat organically grown food, if available? Will it take a campaign of collective outrage that exposes babies to the contamination of insecticides, PCBs, PBDEs, flame retardants, fungicides, wood preservatives, termite poisons, mothproofing agents, toilet deodorizers, dry-cleaning fluids, gasoline vapors, and dioxins etc. be what is called for? Fahey ascertains that moms need to be enraged and rise up and assert that their babies have a right to untainted breast milk. She believes that "Until green chemistry gets here, the best thing we can do is pretty much what we're already doing: trying to push for laws to restrain the worst industrial and agricultural sources, push industrial design towards non-toxic components, and build compact cities with more greenery and many fewer cars (since the auto industry's one of the prime culprits)." Drop-Side Crib Alert: Did Everyone See This? Congress is moving to ban drop-side cribs, which have caused a number of infant deaths when the mechanisms malfunctioned. But the cribs will still be available in stores for a while as well as on eBay, so we wanted to make sure our readers heard about the malfunctions! The baby crib, usually a safe haven for little ones, became a death trap for 6-month-old Bobby Cirigliano. The side rail on his drop-side crib slid off the tracks and trapped his head and neck between the mattress and the malfunctioning side rail. His face pressed against the mattress, the boy suffocated. We encourage everyone to read the full article and pass along the information! We are thrilled to find beautiful handmade Montessori equipment for infants on Etsy. This simple Bell on a Ribbon hanging toy is created by goosedesigns, a wonderful Etsy shop. 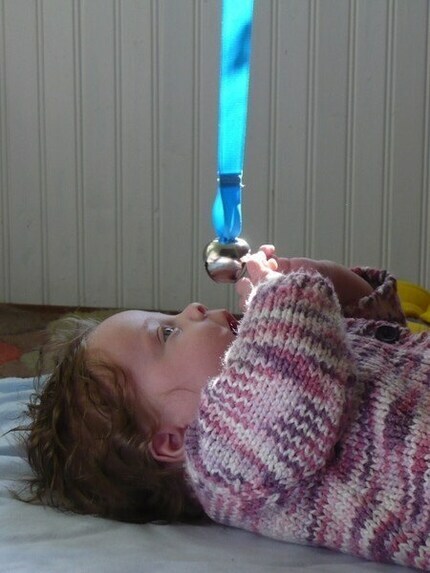 The Bell on a Ribbon provides both attractive and attention-grabbing color with sound, so your infant can focus his or her energy on reaching and grasping the bell as well as batting at it to make sounds. In addition to sound, the ribbon on this toy is meant to stretch, providing some give when your infant grasps and pulls. If you are bringing home a newborn or looking for material for your infant, search for materials that help your infant satisfy his or her curiosity, urge to touch and handle, and desire to be able to influence his or her environment. 1. 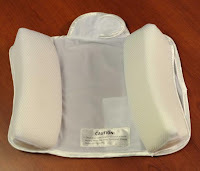 Think of adding a little cushion bed on the floor provides support for your infant without being so soft that your infant sinks down uncomfortably. 2. Add shelves with equipment provide visual stimulation as your infant eyes what he or she would like to touch. Keep the low shelves stocked with material that your infant can handle and use now at this stage of development. 3. The spaces between the shelves allow your infant to see and hear what is happening in the rest of the room, so that he or she is not isolated. Learn more with our Montessori teaching album for infants and toddlers. I love this short video! If you have a sturdy mobile, attach a rope pull to it with a wooden handle, so your child can make the mobile pieces clang together and move by tugging the handle. A lot of parents ask if we can provide them with a Montessori teaching curriculum album that concentrates solely on math or reading because they view the rest of the Montessori curriculum such as music, art, and sensorial work as extraneous to "real" learning. But what is real learning? Montessori education focuses on overall brain development as key to the whole spectrum of learning, ranging from social skills and gross motor function to reading and math. So, we encourage everyone who buys our Montessori teaching albums to fully engage and use all sections of the albums from the practical life and sensorial work to the math, science, and reading lessons. "It is amazing to me that Dr. Montessori was able to develop her materials without the benefits of today’s technology. She could not view a child’s brain to see which areas lit up when they were using the Cylinder Blocks, and yet through observation she knew that a child’s fine motor skills, shape and size discrimination, and hand/eye coordination were being strengthened through this work." One of the more interesting discussions her article brings up is the work by Dr. Steven Hughes, PhD, L.P. Dr. Hughes is a pediatric neuropsychologist and Assistant Professor of Pediatrics and Neurology at the University of Minnesota Medical School, and a diplomate of the American Board of Pediatric Neuropsychology. "Why do young children, who are still developing the ability to understand language, spend so much time sitting and listening to teachers at a conventional school? Wouldn't it be nice to design an educational model around hands-on activity, physical manipulation, and engagement in the world? Maria Montessori did just that. There is a model of the way the brain is organized and how it works which I refer to as the nuggets and networks system. Areas of the brain do not function in isolation, they communicate with other areas through networks of active fibers. Brains need healthy nuggets and healthy networks in order to function. Nuggets can be defined as small, circumscribed areas of the brain that perform a specialized function is reading. Reading is a cognitive function that requires the coordinated use of more than one nugget. Reading does not happen in one spot in the brain; it's the coordination of multiple spots that cover things like letter and word recognition, phonological processing, and language comprehension. Somehow, Maria Montessori knew about these nuggets. The Montessori reading curriculum is astonishingly dead-on in helping developing brains condense the nuggets that perform these certain functions." "...the next generation of educators will need to broaden their approach—focusing not just on teaching math, for example, but also on how math reasoning develops in the brain. Meanwhile, scientists should take the needs and concerns of educators into account as they continue to investigate how we learn. Such crosstalk is already occurring in collaborative efforts focusing on learning, arts and the brain. Research shows that learning changes the brain. The brain is “plastic”—it makes new cellular connections and strengthens existing ones as we gain and integrate information and skills. In the past decade, the enormous growth in understanding brain plasticity has created an entirely new way to consider how learning and achievement take place in the education of children. Whether or not a teacher understands fundamental concepts derived from basic brain science, such as plasticity, can have a profound effect on how he or she views the learner. Many classroom teachers today, for example, were trained at a time when scientists thought the brain was fixed at birth and changeable only in one direction: degeneration due to aging, injury or disease. Such a misunderstanding of brain anatomy and physiology would limit a teacher’s view of the learning capacity of children, especially those who enter the classroom lagging behind their peers. For example, a teacher may think that a fifth-grader who has failed to master basic mathematics skills will always struggle with math because of limited cognitive capacities. Contrast this view with contemporary knowledge that the brain constantly changes with experience, makes new brain cell connections (synapses), strengthens connections through repeated use and practice, and even produces new cells in certain regions. Imagine how differently a teacher armed with this information would view students’ capacity for learning. Knowing that experiences change the brain might encourage this teacher to design targeted remedial lessons. Engaging the student in multiple, creative math-oriented tasks might do more than increase achievement scores: It might actually change brain circuitry." For all of you teaching at home or in schools, we highly recommend reading the rest of this article. Cut a hole in the bottom of the basket. Store the balls in another basket or box. Hold the basket as your toddler throws the balls or sponges into it. 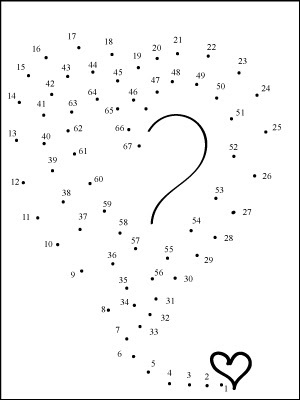 Try this project and see how long your child amuses him or herself with this exercise! Should I Buy Montessori Equipment for Home? If your child attends Montessori school outside of the home, it is better not to buy duplicates of the equipment that he or she uses in school. The presentation you give will be different from that given in the classroom and, besides, your child will have plenty of time to use it at school. If you are homeschooling, you absolutely need the equipment! A few pieces of age-appropriate equipment plus a one or two pieces of material that will be at your child's next level will provide a basic platform for creating a full range of material at home. Mix in DIY equipment and you are done. If you have a talent for DIY, then you need to purchase almost no equipment. What is hard to make? The Golden Bead and other bead material for the math section can be tricky and the Movable Alphabet can be tedious to make in cut-out form, but almost everything else can be made fairly easily. Visit Montessori for Everyone for some great Adobe PDF material. Learn more about making equipment and using it with our Montessori Teaching Album for Infants and Toddlers. We wanted to share some tips and ideas for parents or teachers who want to use the Montessori approach to teaching at home or school. 1. The environment matters lots. Have at least one room that is equipped with low shelves and child-friendly material. Everything in this room should be touchable -- no glass tables that are off limits or adult computer equipment. 2. Have material on these shelves that addresses your child's needs. For example, if your child does not yet read, your basics should include the Sandpaper Letters, Movable Alphabet, Sandpaper Numerals, Spindle Boxes, Red Rods, Pink Tower, Geometric Solids, and the Geometric Cabinet (or equivalent). 3. Create a reading corner in this room or another quiet room. Your book shelf should have non-fiction books ranging from information on bugs and plants to trucks and tractors. 4. Have mats for floor work so your child can spread work out on the floor. The mats are carpet about the size of a yoga mat. 5. Practice introducing new concepts in a simple way. Looking at a mirror, introduce colors using the Color Tablets. Say "red" as you pick up the red tablet. Repeat for the other colors. Pretend you are teaching a friend who doesn't speak English the names of the colors. You wouldn't make long sentences, right? Because the words would get lost in the discussion. The goal is to associate the new word with the object in the most streamlined way possible. 6. Is your child or student working? Resist the temptation to check up on them or interfere. The goal here is to let your child cultivate his or her powers of concentration, becoming absorbed in the material that he or she is using. 7. Are you in a classroom setting? Start the morning off with a short group activity to get all the children focused on the day after their commute to school. 8. Speak quietly. If you raise your voice to be heard over the din of children talking, the whole class will get louder and louder. Practice speaking more softly so that everyone has to be quiet in order to hear you. 9. Resist using "No" to correct your child. If you ask your child to hand you the blue tablet and he or she hands you the red tablet, say "that is red" and add "can you find the blue". Notice how we cut out a lot of words here such as "No, that's not the right one...don't you remember" and etc. Make this a strict practice. 10. Video tape yourself teaching your child, practice on adults and older children, and sit down at the end of the day for ten minutes with a cup of tea to reflect and write down a review of your day's teaching. Montessori curriculum for homeschooling and classroom use is available on our site! This "Services In School For Children With Special Needs: What Parents Need To Know" is a useful article from "The American Academy of Child & Adolescent Psychiatry" focusing on the laws that govern services public schools are obliged to provide special needs children. * The Americans with Disabilities Act (ADA) (1990). Different states have different criteria for eligibility, services available, and procedures for implementing their laws. It is important for parents to be aware of these laws and regulations in their particular area. This is the set up for introducing letter sounds and objects that start with that sound. In our curriculum guide, the layout and instructions can sound a bit mechanical, so we wanted to show you a real life example. Notice how much fun the boys are having working together! You can also expand on this exercise to include more objects, more sounds, and more children to make a lovely group game. More information on curriculum in our Montessori curriculum guide for toddlers on our site. 1. Buy two different sizes of nut & bolt sets. Your child can practice fitting them together and distinguishing between the sizes. 2. 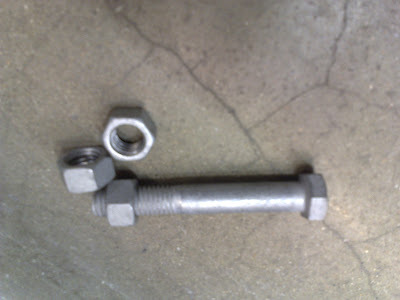 Buy one size bolt with four or five nuts. Your child can put all the nuts and then take them off. 3. Install the bolts in a board. Montessori Curriculum for Infants and Toddler on our site. These fabulous blocks are handmade in Maryland, USA, by us at Montessori House! We lovingly hand-craft our wooden blocks here in Maryland. The blocks are made using hand tools and Crayola markers with an organic olive oil rubbed finish. 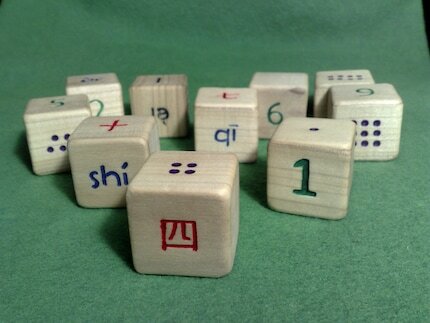 This set of ten blocks introduces the Chinese characters for numbers from 1 to 10 along with numerals, pinyin (the English language pronunciation for the Chinese characters), and quantity dots. The characters are etched with hand tools into the wood, which is then sanded to a soft finish with rounded edges and corners. Your child will enjoy tracing the engravings as he or she learns to associate the quantities with the bilingual characters. The numerals are colored green corresponding to the Montessori math system. Safe for infants and toddlers of all ages. Visit us at Montessori House for more Mandarin Chinese learning material for children. Cool Mom Picks is hosting a Valentine's Day card contest, so we put together these two submissions (the heart by numbers card was originally posted on our general Montessori blog). You can right-click on either of these images to save and print them for coloring at home! The importance of recess and active play are often discussed for school-aged children, but not as frequently for younger children, so we have a few quick tips for everyone working with their children this winter. 1. Make a safe carpeted space on the floor for rolling and playing. Everyone removes his or her shoes first. 2. Using this indoor space, make movements that your child can imitate. For example, clapping your hands, clapping your feet together, rolling like a log, kicking your feet in the air, making bicycling movements with both hands and feet, tossing a bean bag back and forth with a partner, and other age-appropriate movements. 3. Incorporate simple movements from whatever exercise or sport you know yourself. For example, basic yoga postures (see the camel sample below), pushing around a basketball, or playing with a tennis racquet can provide lots of good exercise and fun as well as developmental practice for your child. 4. Look for simple wooden wheeled toys that your child can push, pull, or ride. 5. Bundle up and go outdoors to walk whenever possible. Take your toddler out of his or her stroller, allowing him or her to enjoy walking on the snow or toddling in winter boots. I just had the misfortune of actually handling a rattan bassinet and the experience was horrifying. The sharp edges on the rattan coupled with the kindling-like quality of the rattan were so dangerous I couldn't believe the bassinet was on market. Rattan is used to fuel cooking fires in many parts of the world because it is so flammable. The photo shown here is not the same one, but it is pretty close. 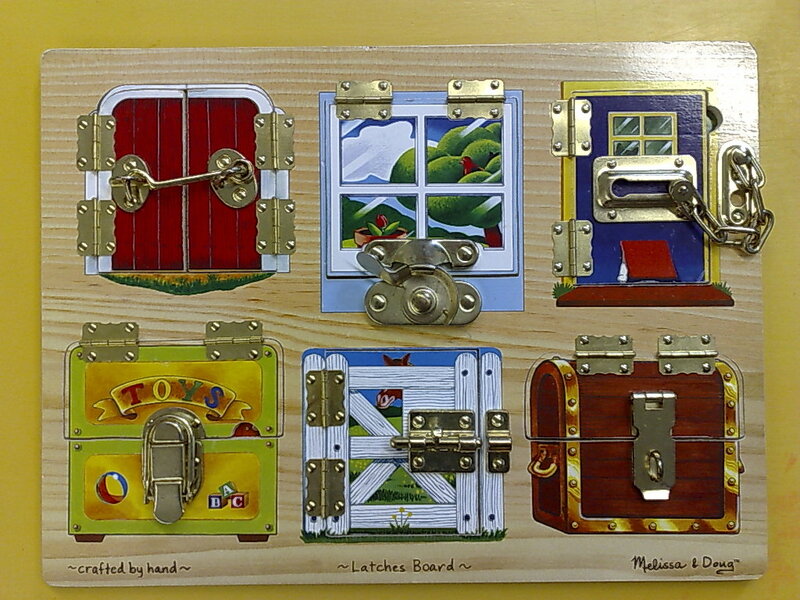 Plus, I doubt that the lacquer and finishes used on this type of furniture is child-safe. We found a wonderful book by a fellow Montessorian, Shakta Kaur Khalsa, called "Fly Like a Butterfly". Her book includes great photos and easy-to-follow text and we have shared an excerpt below from her Children's Yoga site. Bumpy Camel gives you a flexible spine. Keeps your back muscles relaxed and strong. Helps you digest your food.